I’m Ed Smith, a Sacramento Personal Injury Lawyer. The liver is one of the most important organs in the body and has been appropriately named. It serves numerous vital functions and helps the body to regulate the various levels of nutrients in the bloodstream and tissues. This organ is also prone to be damaged in traumatic accidents, as a recent case report on a serious bicycle accident demonstrated. Almost everyone learns how to ride a bike while growing up and while the saying is that people don't forget how to ride one, it is always important to review important safety tips. This will help prevent traumatic injuries from occurring in bicycle accidents. Always Wear a Helmet: Perhaps the most important piece of advice, everyone needs to make sure that they wear a helmet, regardless of whether they are driving a bicycle or a motorcycle. Helmets can help prevent people from sustaining traumatic brain injuries in a bike vs. auto accident and could wind up being life-saving. Use Bike Paths Whenever Possible: While this is not always a possibility, many roads have bike paths along the side where bicyclists can ride without having to worry about cars or pedestrians. If this is available, take advantage of it. Furthermore, make sure to bike in the appropriate direction down the path. This will help avoid unnecessary collisions. Try Not to Ride at Night: Sometimes, people enjoy taking their bike out at night because the weather is a bit cooler and the roads aren't as busy. On the other hand, it makes it more difficult for cars to see cyclists. Try not to ride at night when possible because a collision with a motor vehicle can lead to catastrophic personal injuries. If biking at night is unavoidable, make sure to have a light on the bike so that cars can see the cyclist. Recently, a team of doctors had an interesting case report present to their hospital following a traumatic accident. A young teenager was riding his bike down a local road when a car pulled out in front of him. He collided with the hood of the car and flipped over the handlebars of his bike, landing on the hood of the car with extreme force. The driver of the car exited the vehicle and checked on the child before calling emergency personnel. When they arrived, he was quickly evaluated at the scene medical attention was deemed necessary. He was transported by ambulance to a local hospital where he was evaluated for blunt abdominal trauma. 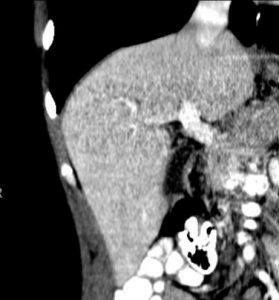 The physicians were worried that he had ruptured some of his internal organs and ordered an imaging scan, which demonstrated serious lacerations of the liver with concern for rupture of the capsule. He was transported quickly to the operating room where exploratory surgery was performed. His liver was quickly repaired, the bleeding had stopped, and he was transported to recovery. He continued to have some minor bruising that was slow to heal; however, he did recover after a routine hospital stay. Unfortunately, liver damage is a common location of abdominal injuries and, unlike the kidneys, there is no dialysis for people with chronic liver failure. While hepatitis and alcoholism continue to remain as some of the most common causes of liver damage, traumatic liver injuries are a serious concern as well. When people present with bruising of the abdomen, the most important concern is to make sure that there hasn't been any rupture of internal organs. If there has been a rupture, this necessitates emergent surgery with repair to stop the leakage of important bodily fluids into the abdominal cavity. If there hasn't been any rupture, the individual must give their abdomen a rest so it can heal on its own. Sometimes, this necessitates several days without eating. In this situation, the individual will receive artificial nutrition through their veins. Sometimes, it can be challenging for families to make ends meet following a serious bicycle accident such as the one described above. A skilled personal injury attorney can help families review all of the options available to them while removing some of this stress, allowing the family to focus on the important task of recovery for their loved one. I’m Ed Smith, a Sacramento Personal Injury Lawyer. If you have suffered liver damage in a bicycle accident, contact me for free, friendly advice at 916.921.6400 or toll-free at (800) 404-5400. The Million Dollar Advocates Forum has opened up a spot for my membership in the state of California. This group of lawyers has had its members ranked among some of the top trial professionals in the entire country. A large number of verdicts and case settlements valued at over $1 Million dollars have been negotiated or earned by the members of our forum. I encourage all of my visitors to take a look at what my office has earned with earlier verdicts and settlements. I have stored the reviews that have been put together by past customers at Avvo, Yelp, and Google. Image Attribution: The image from the top, found first on Wikimedia Commons, has been shown here under the 3.0 version of the Creative Commons License.